We peruse the menu and inquire about the size of their small plates. 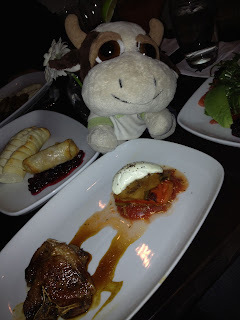 The server assures as that if we share a few small plates we should be sufficiently satiated, and order an array of interesting looking items. As we wait for the food, the designer chairs live up to our worse fears and become increasingly uncomfortable as the female human begins to lose feeling in her lower appendages with her feet dangling, as the chair is a tad too high. After a position change, the seat begins to cut off circulation to her legs from pressing into her. We opt to ask the hostess to be moved to a booth that's recently been vacated or leave if it’s not possible, as the bar height stools would pose the same issue for the girl. We explain the situation to the hostess and request to be moved to the empty booth, and unfortunately the hostesses’ first response is an immediate no. We regretfully inform her that we will have to cancel the rest of our order and leave as the humans are literally in pain and cannot continue to wait, sitting in the plastic chairs. 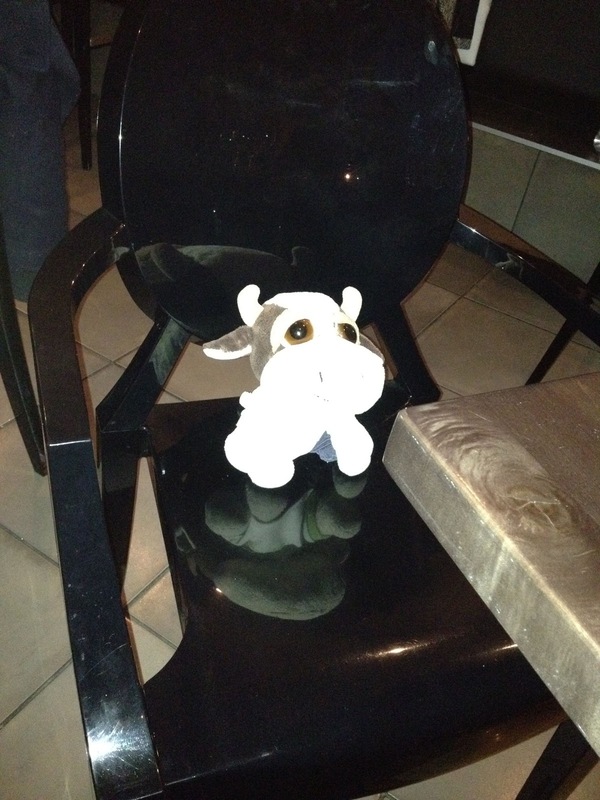 Only then does she move us to a booth but warns us that the booth is reserved for another guest in an hour. Thankfully our food arrives quickly once we are resettled in more comfortable furnishings. We start with the sweet potato curry with vegetables, chickpeas, kaffir lime leafs, and fresh baked cornbread. The sweet potato curry has a mild heat to it with a slightly sweet after taste. Unfortunately we didn’t detect any chickpeas, just an over abundance of regular peas compared to sweet potato. The curry also had a watery tasting finish to it. The pan roasted lamb t-bone with goat cheese crusted vegetable gratin consisted of two very small portions of lamb the size of my hoof. Although they were moist and juicy, there was far too little meat, consisting of roughly 1/3 of each bone, meat, and fat, leaving me longing for more substance. The phyllo wrapped camembert with Saskatoon jam and toasted baguette was fairly standard and similar to other restaurants. The camembert was nice and melty on the inside, but nothing spectacular or different than others we’d tasted previously. 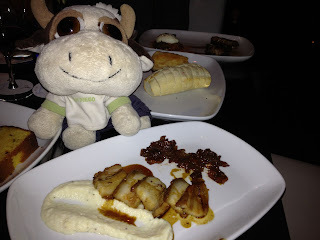 The crispy fennel pork belly with tomato jam, cauliflowers puree and natural jus was my favorite of the night. The pork belly was crispy yet melt in your mouth, while the cauliflower puree was unfortunately bland and could have been omitted from the dish. 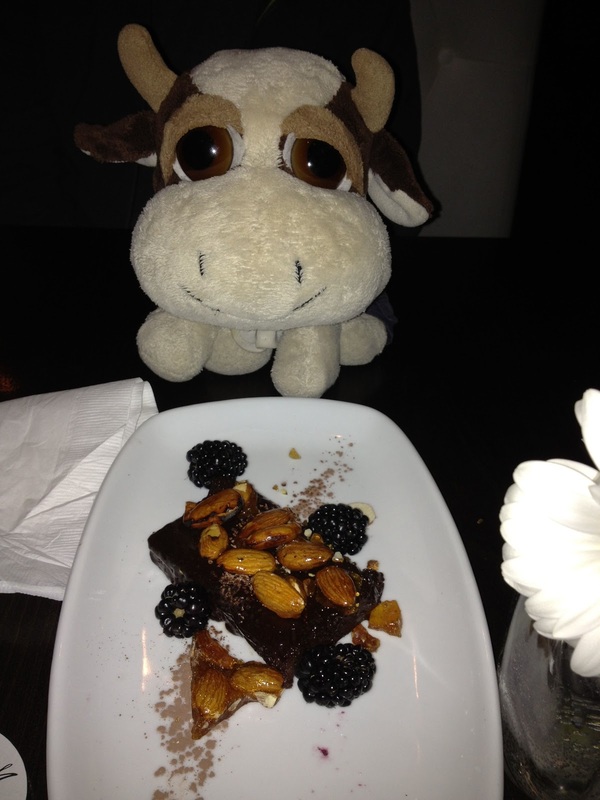 We end our visit with their chocolate marquis, consisting of a very thick, dark chocolate mousse and candied almonds. The almonds are too hard to bite into, but the mousse is delectable, not too sweet or dense, and thoroughly enjoyed. However, we leave the restaurant with an almost 3 figure bill, and still feeling hungry. Despite the fact that the menu has changed since our visit, the uncomfortable furniture, mediocre food, small portions, and high prices, leave us with no desire to return. Really interesting narrative.... those chairs sound dreadful! They really were. Although design of a space can be as important as the food they serve, comfort definitely needs to be considered so that patrons can sit and enjoy their food for the hour or so that it takes.